Making government accountability Open Source! That's what Sunlight Labs is trying to do with this contest. And you could win $15,000! Just take one of their databases on Congress and make a cool new front end. "Entries can be client applications, web based applications, applications that use the Adobe AIR platform, Java applications or whatever other kind of platform you'd like to write it in. We use Django for most of ours. " 'Tisn't History, yet history is much advanced by improvements in technology, in the ability to lay roads and join together separated peoples. A good bridge has won or lost many a battle. We wrote here before about the Bridge on the River Kwai; and the horrible toll on the workforce which built it. Many readers will recall the cool scenes of bridge operations in Saving Private Ryan. 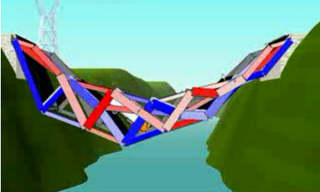 Here learners can play with bridge designs and see how they hold up. Its actually pretty simple. The trick is remembering that what you are doing in seconds took years of hand calculations for engineers like Charles Ellis, engineer of the Golden Gate Bridge. This comes from, who else, the U.S. Military Academy!